With great power comes the risk of great corruption. The Crazed Shaman used to be the kind-hearted Shaman many moons ago. The rumors whispered in the tavern say that he became drunk with his own power, turning his back to the village and recklessly handing out powerful Totems like they're going out of style. He is dangerous, not just to the Werewolves, but to everyone in the village. For beginner games, during the Identification Phase, simply have the Crazed Shaman open his eyes so that you can confirm that he knows he is the Crazed Shaman. During the Night Phase, have the Crazed Shaman open his eyes and choose three Totems at random from the stack of Totems. Show them to the Crazed Shaman. Have him select up to three players that he wants to give a Totem to. Distribute these three Totems randomly among the people he chose. As owning a Totem is not a secret, you can be less than discreet at distributing Totem cards. Be careful not to accidentally let anyone see what the Totems are. Take note of who gets which Totem, but do not let the Crazed Shaman know who got what. The people who receive the Totems are not allowed to look at them at any point, but they do know that they got a Totem. After the Totems are handed out, have the Crazed Shaman close his eyes. - "Crazed Shaman, open your eyes. These are your three Totems. Please choose up to three people to get a Totem." - "Crazed Shaman, close your eyes." For a list of Totems and how they work, please go to the Totems page. At this point, make a note about which players received which Totems. Be sure to keep track of their effects on their recipients. A notepad or scratch paper may be useful for keeping track of multiple Totem cards. At the end of the next day phase, after someone is lynched, send the village to sleep and pick up any Totems in front of the players. Allow the Crazed Shaman to decide who gets which totem instead of assigning them randomly. This provides a substantial boost to the control and power of the Crazed Shaman. Since the Crazed Shaman still cannot win, this is not necessarily an influence of the balance of good or evil. Allow the Town Mayor to select which totem players receive instead of assigning the three totems randomly. This allows the GM to influence the game direction, be it favoring one side or another or pushing the game back towards a balanced state. Note that the GM should make sure everyone is aware of and agrees to this rule before implementing it. To add more mystery to a Mystery Game, have the Town Mayor take the role of the Crazed Shaman and other roles that have a visible nightly effect on the game. In this instance, try and roleplay the actions the Crazed Shaman would normally perform, creating chaos in the village. Note that this variant of the Mystery Game rules requires a very experienced GM. Can the Crazed Shaman choose to give out zero Totems? Yes, he can choose between zero and three people to get Totems. Can the Crazed Shaman give a Totem to himself? Yes, the Crazed Shaman can give Totems to himself, but they're a lot more fun if you inflict them on your friends. ;3 Be aware that you may accidentally kill yourself if you do this. Can I play with the Crazed Shaman and the Shaman at the same time? Yes, but be aware it can put quite the strain on your sanity as a GM. If you choose to use both cards, the Shaman gets called first, and his one Totem is handed out before the Crazed Shaman's Totems. Keep a notepad or some scratch paper available to jot down how Totems are distributed. No, really. Use a notepad, you will need it. Can the Crazed Shaman give a Totem to the player who already has one? Yes, but we hold no responsibility for the new and fun ways you may find to break your brains. Please see the Totems page for how to handle players receiving combinations of Totems. Can I keep giving Totems to the same person every night? Yes, but you can't give one person more than one Totem. What happens when a Totem expires? The Totem cards are shuffled back together at the beginning of the next Night Phase so the Shaman always has a full set of 7 Totems to work from. Why can't the Crazed Shaman win? All of the Wild-aligned cards have special winning conditions or cannot win at all. Unlike other cards, the Crazed Shaman does not have a goal or agenda that he can work towards in order to win the game. Having a pre-defined objective is antithetic to the intended purpose of this card. 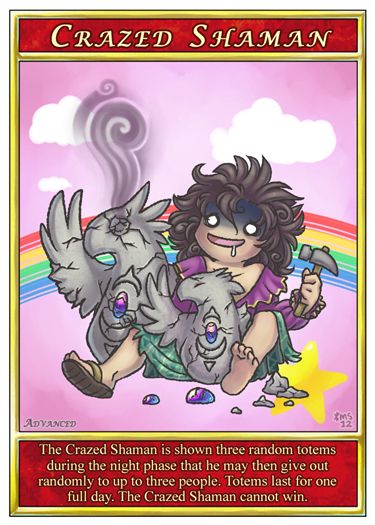 Instead of trying to stay alive until the end of the game, helping a group of players win, or meeting some obscure winning condition, the Crazed Shaman simply exists to practice his ability. As long as the Crazed Shaman is able to do this, he is winning in his own way. Of course, players are encouraged to think of their own reasons and theories for why this is! Hey, this guy looks kind of familiar. He's the same guy as the Shaman! What happened to him? If you have a question about this card, send us an e-mail! Everyone in the village will probably want you dead. If the Shaman is in play and you notice that no totem was handed out before you opened your eyes, that means that the regular Shaman done got himself Hexed. Consider handing out only one Totem today and 'pointing out' that the 'Crazed Shaman' is the one who got Hexed. That might take a bit of heat off of you as well as cause some confusion. Be aware this might help the non-crazed Shaman figure out who you are. Have a good strategy or tips for this card? Send us an e-mail! Back to the card list.